Broken Gold’s Address: 1648 Memorial Dr.
Gold Package Contents: Broken gold sent a letter sized envelope containing a welcome letter, a brochure with instructions for how to send in gold and a personal tracking number, an insert describing their fast pay option (which is a direct deposit to your bank account), a small zip lock bag, and a tyvek envelope with the postage prepaid. SellGoldHQ.com is an independent reviewer of precious metal brokers. All brand names, logos and trademarks on SellGoldHQ.com are the exclusive property of their respective owners and are not property of SellGoldHQ.com. If you would like to contact Broken Gold please call 888-920-5111 during 9am to 5pm EST. Let us help you find the most profitable decision for your used gold and broken jewelry. Based on feedback from our visitors and our staff's most commonly answered questions about selling gold we have created a helpful ebook that is 100% free for any consumer thinking of selling gold online. This ebook will teach you common mistakes made when selling gold, clarify confusion that past gold sellers have reported and much more. Get your free copy of Dollars and Sense of Selling Gold ebook. Stay tuned for our next poll! 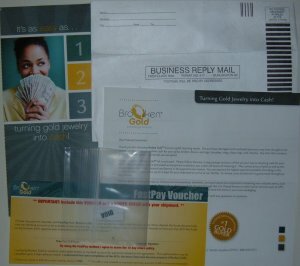 This free gold sellers resource helps thousands of consumers avoid gold scams and making poor decisions. We are only able to do this with the support of our community. If the information on Sell Gold HQ has helped you please consider making a donation to help keep this site live or help expand our resources by sharing your experience of selling gold with our visitors. Donate Today!